If you are still thinking which wireless broadband provider in Malaysia to choose from, hopefully this will help you out. Celcom is currently having a great promotion to get you to sign up to their Celcom Broadband service. 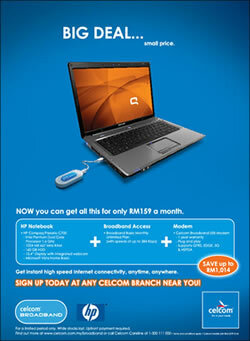 This promotion includes service for Celcom Broadband, a Compaq Notebook and a USB modem. You get to bring home all this for only RM159 a month! You get to save up to RM1014. You will be signed up to the Celcom Broadband basic package which costs RM68 per month. This package allows you to surf the Internet with speeds up to 384 Kbps. The Celcom Broadband USB modem comes with 1 year warranty. This looks like a pretty good promotion. At least until I read the fine prints. * Upfront payment required. Minimum subscription of 24 months. For a limited period only. As usual, you can find out more at Celcom’s promotion page at the official website or call Celcom Careline at 1-300 111 000. You can also call 1111 directly from your Celcom mobile. If you prefer a more personal approach, just visit your nearest Celcom branch or Blue Cube outlet. Offer valid while stock lasts! 3 Year Web Hosting For Only RM100! More than a year ago, I started blogging on a free blogging platform — Blogger.com. A few weeks into it, I knew I had to get my own domain name and move onto paid hosting. That was when I started looking for a reliable and cheap web hosting package. It wasn’t an easy task. Most companies I found offered huge disk space and bandwidth but cost a bomb. I was just starting out therefore I do not expect to use anything near to what they were offering. So, it didn’t seem to be such a wise idea to invest in a hosting package like that. After short listing more than a dozen web hosting company and more consideration, I decided to put my money on ServerFreak. A friend of mine was using it and had recommended it to me. I signed up for the cheapest package and paid monthly just to try them out. That way, I can cancel it and look for another web hosting provider if I wasn’t totally satisfied with their services. If I am not mistaken, it was only RM4 per month at that time. A few months later, I upgraded to a RM6 per month package and it has been renewed until now. Am I a satisfied customer? Totally! Any emails or messages to customer support are replied within a few hours or minutes at times. For the price I paid, I wonder if they even make any money out of it. Now, good news for you people out there. ServerFreak is having a festive season promo thing going on right now. When you buy or renew 2 year hosting between 1st October 2008 and 15th November 2008, you will get 1 year hosting completely FREE! Just key in the coupon code free1year and you are good to go. This offer is valid for linux and windows shared hosting packages. That is RM100 for 3 years of web hosting. I was more than delighted when I received news of this offer. Now, I don’t need to worry about my web hosting payment come month end. Well, not until my traffic increases to the point that it exceeds my monthly quota. Anyway if that does happen, wouldn’t that be something to cheer about? It has been almost a year since the first time I successfully withdrawn Google Adsense earnings through Western Union. I made the withdrawal at my local CIMB Bank branch. It was a very pleasant experience. I was served almost instantly and the counter staff was very polite. From then until now, I made several other trips to the bank to withdraw my Google Adsense earnings. My favorite bank to withdraw from Western Union is no other than CIMB Bank and here is why. The only other bank I use apart from CIMB is RHB Bank. I have only used RHB’s services for Western Union transactions twice. The first time was when I wanted to cash out my second Google Adsense payment. The truth is, the experience wasn’t anything to shout about. I had to wait at least twice longer for them to process my payment compared to CIMB. I vowed never to return again. But I did. The second time was just a few days ago. The reason why I did was I thought that my first bad experience could have been just a one off case. Furthermore, I went into CIMB only to be told that their Western Union was offline. So, I didn’t have any other choices. I spent close to an hour in RHB that rainy afternoon — around 50 minutes or so. Although most of the time spent was to wait for my turn, the time it took to process my payment wasn’t that quick either. On my last trip to CIMB, I was in and out of the bank in no more than 15 minutes. I really have no idea why it takes RHB so long to process a Western Union transaction. Maybe they have tighter regulations to follow? I don’t know. However, one thing I do know is that I am never stepping my foot into any RHB bank for a Western Union transaction ever again. Well, never unless CIMB is offline. Are You Gonna Nang My Innit? I am lucky enough to have attracted someone who wanted to be a guest blogger in this technology blog. However, this person does not wish to disclose his/her identity yet under certain circumstances. After reading the guest post, I agreed to publish it in my blog. Please note that the post below is a guest post. It wasn’t written by me. However, I do share some of the sentiment brought up in the post. Critics and comments are highly welcomed to help improve the services and purpose of the said website. Innit. The latest system available from Nuffnang which promises to drive traffic to Nuffnangers. It’s definitely a very promising move and caring at the same time as traffic fundamentally is the core subject in determining a person’s blog earning or more specifically in this case, one’s Nuffnang’s earning. The reason it’s caring and controversial at the same time lies on its aim of increasing traffic volume. Advertisers pay more for higher traffic blogs, no doubt. Hence, by increasing blogger’s traffic in a legitimate way, it helps the bloggers to have a much wider exposure and hence advertisers paying them a higher premium in return, more or less a deliberate attempt of a win-win situation from both ends. However, this key feature isn’t exactly an easy task. How do you deliberate exposes the blogs to a whole new level in spite of the existing available means? The platform the current bloggers in the Malaysia and Singapore region relies on their own Project Petaling Street and Ping.Sg. So, the million dollar question is, what makes Innit standout to outperform the existing platforms? From the prevailing Innit outlook, it looks like another format of Ping.sg. Though Ping.sg is more or less restricted to Singapore bloggers, Innit caters for only pure nuffnangers. Therefore, Innit doesn’t actually offer what we don’t already know from driving traffic when in fact it applies the same principle as PPS and Ping.sg. To conclude, the most fundamental aspect at the moment that would really make Innit stands out is how enthusiastic are the Nuffnangers, are they going to be the force to distinguish themselves from the existing PPS and Ping.Sg users and make the nuffnang community readership beyond our common logic or comprehension ? So, this post is gonna be on Innit, I wonder if it’ll be “nang”ed ? Since it is almost 5 am, I couldn’t really think straight right now. I do have my own opinions regarding Nuffnang’s Innit as well. I will put them in the comments area or update this post once I have the time. If you haven’t already, please nang this post. I noticed my CPU was running at very high temperatures a few weeks ago. Just the other day, I decided that I had enough with the CPU overheating problem. I took out a screwdriver and proceeded to removing the heatsink from the motherboard. The screwdriver wasn’t used to unscrew any screws (there isn’t any screw to the heatsink and fan) but to help remove the fan from the “cage”. It has been many years since I last did anything like that. It took me a few minutes just to remove the heatsink and fan! Once I have successfully removed it, I was staring at the motherboard where the heatsink and fan used to be and felt really strange. It took me a couple of seconds to realize what was the problem. Can you spot the “problem”? That is when I realized my real problem has just started. 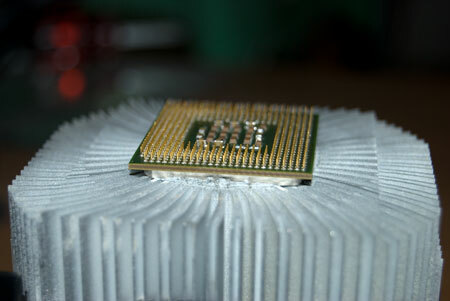 I turned the heatsink that I was still holding around and found what I was looking for — my Pentium 4 processor. 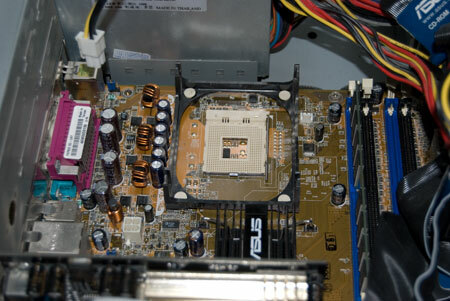 The processor was stuck firmly onto the bottom of the heatsink. It was as if the two were “glued” together by the thermal paste applied in between them. The overheating problem must have sealed them together. I tried to separate them with my hands but they were dead stuck to each other. I had no choice but to continue with my plan to clean the heatsink and fan while leaving the problem to be solved later. I removed the fan that was attached to the top of the heatsink. It was my first time doing it so I proceeded cautiously. I didn’t want to hurt myself but more importantly, I do not want to drop it causing damage to the processor. I was shocked when I saw the condition of the heatsink. No wonder the CPU was overheating! There was a thick layer of dust covering the top of the heatsink. The air blown into the heatsink was somehow disrupted by them. I removed the thick layer of dust with a few pieces of tissue paper. You have no idea how much dust they were. 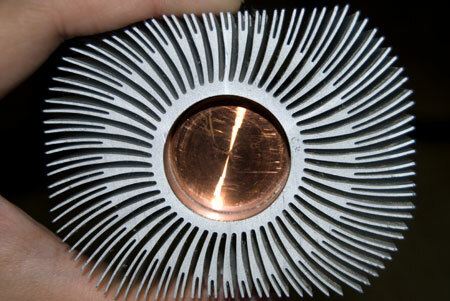 That is a spanking clean heatsink. There are still some dusts in between the heatsink plates but I have removed most of them. It was time to solve the processor problem now. The only option I had in my mind at that time was to carefully place the heatsink back onto its slot. Since the processor was stuck to the heatsink “in the right position”, theoretically, the processor would slide into its slot correctly too. It was still a huge gamble because the processor pins could easily bend when I am sliding it back and forth hoping that it would slide into its slot. When I was quite certain that the processor was in place, I had to “lock” the heatsink and fan into its slot. This will then push the heatsink firmly down. I said a short prayer before doing this because if the processor wasn’t in place, all of its pins will be bend causing maximum damage. An error message greeted me when I booted up the computer. It mentioned that “CPU wasn’t found”. I thought I must have caused some damage to the processor or it wasn’t in place properly. However, I also noticed that it was able to detect the presence of a Pentium 4 3.0Ghz processor. I knew there was still hope. I entered BIOS and exited it while saving the changes. My computer booted up like normal the next time around. Everything is back to normal now. I notice that my CPU is running at a much lower temperature as well at around 50 degrees most of the time. It used to run at 60-70+ degrees previously. My CPU fan speed can now reach over 3,000 rpm compared to previously when it was stuck at only 2,700 rpm max. This little clean up saved me from buying a new heatsink. 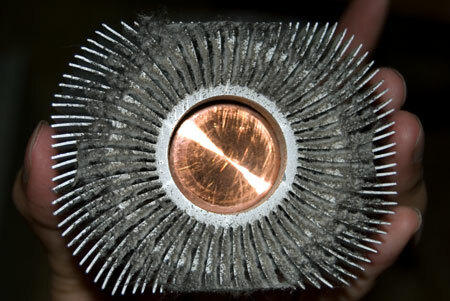 If you have CPU overheating problems as well, you can try cleaning your heatsink and fan. Just make sure you know what you are doing before attempting to try this though. You do not want to make things worse.